Looking to purchase a ski vacation home? No place better than Park City Utah! 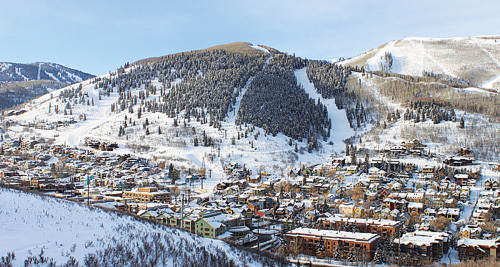 Park City is a small ski resort town in northern Utah, and is home to three major ski resorts; Deer Valley Resort, Park City Mountain Resort, and Canyons Resort. With three major mountain resorts in one town, there simply is no better place to buy real estate. Many people from across the country have chosen Park City as their ideal location to own a second home or vacation home. The Salt Lake City International Airport is only about 35 minutes away, an easy drive for travelers. You can even fly in the morning and be skiing in Park City that same afternoon! This ease of travel has influenced many people to choose real estate in Park City. There is such a wide range of great choices when searching for homes for sale in Park City. Old Town is the popular downtown area of Park City that includes ski-in, ski-out homes near historic Main Street. Thaynes Canyon and Park Meadows offers a more residential home setting, and The Aerie has the most stunning views. You'll find many great homes for sale in Park City listed below. Browse Park City homes for sale below or contact local Park City Realtors Heather Peterson & Sean Matyja for more information about Park City real estate. Looking for a Particular Style of Park City Home? Park City Utah is a wonderful place to own either a second home or if you are truly fortunate, you may be able to move to Park City full-time and enjoy all the benefits as a year-round resident. Depending on the type of home you are searching for, and the amount you will use you new home, you may want to focus your search to certain neighborhoods within Park City. The Park City Board of Realtors divides the area into a few different major communities. These are Old Town Park City, The Arie, Prospector, Thaynes Canyons and Park Meadows. Below is a little more info about each, but if you have questions, simply give us a call at 435-901-2158. Old Town Park City has been a long time favorite for vacation homes and second homes. Close to the resort and close to Main Street, its easy to walk everywhere so there really is no need for a car. If not actually ski-in / ski-out, many of the homes for sale in Old Town are within a short walk to Park City Mountain Resort's base village or to the Town Lift at Main Street. Old Town is quite a mixed bag of property, with a wide range of offerings from twin homes, to small historic miner's cottages, to large custom built luxury mountain homes. Values in Old Town vary widely too, depending on the type of property you are looking at, and where exactly it is located. A similar home on one street can have quite a different price just one or two streets up, or a block or two over. It mostly all depends on the home's walkability to Main Street or the Town Lift. If a home for sale offers a close location to both, that is typically the most valuable. Old Town was "on fire" when the market was hot in 2007, and due to too many builders speculating on future sales dollars, the market for Old Town crashed hard. Old Town is seeing a renewed activity and should remain a sought after location due to its year round recreation choices and proximity to everything fun to do in Park City. The Aerie is a neighborhood just next to Old Town where you'll find homes perched atop a large dome shaped mountaintop. These custom luxury homes boast some of the absolute best views in all of Park City. When looking at homes for sale in Park City, people often forget the Aerie and focus on Old Town and Park Meadows, but The Aerie truly does offer some of the most amazing real estate in the Park City area. Prospector is another often missed neighborhood. This neighborhood includes smaller homes for sale that are close to town, yet tucked away in a more residential community located across from the Park City High School. The free bus route runs through Prospector which makes it very easy to get around, and for kids scheduling to go up skiing, its so easy. Many of the homes in Prospector can be a little older, and somewhat dated, but do not overlook this neighborhood. There are some real gems mixed in, and if you dismiss this community you could really miss out on a great opportunity. If owning a home along a golf course sounds good, you may want to look into the homes for sale in Thaynes Canyon. Thaynes Canyon is a neighborhood near the base of Park City Mountain Resort's Silver Star chairlift, and this community surrounds the Park City Municipal Golf Course. The golf course provides a sense of open space and in the winter serves as a location for a long, winding, groomed x-country ski trail. These Park City homes for sale offer large mature trees, and there is even a few larger lot equestrian properties. The most popular Park City neighborhood for full-time residents seems to always be Park Meadows. Park Meadows is centrally located to all the fun things to do in Park City and has a more traditional single family residence feel. The Park Meadows Country Club golf course winds through the community, and many homes enjoy backing to the golf course which gives them a sense of open space and natural beauty. The most sought after homes for sale in Park Meadows are up on the mountainside, where they enjoy amazing views from their nestled locations. With views and easy access to town, the location of Park Meadows is an ideal choice. Homes for sale in Park Meadows can vary widely from smaller homes at about 2,000 SF that can sell for $500,000 up to larger, custom built, luxury mountain homes up to 10,000 SF that might sell for over $6,000,000. Sales in Park Meadows always seems to be strong as it is such a sought after community. If you are looking for a home in Park Meadows and find something that fits your needs well, move on it quickly or surely someone else will. Need More Info About Park City Real Estate?